Dinu's Yarden: Playing with Bush-Cricket! I was rearranging some old wood that was stocked in the yarden near the pond. When I lifted a piece of wood, something like a grass-hopper jumped on to the ground. 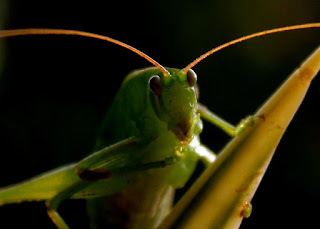 I noticed it was a 'Katydid'. 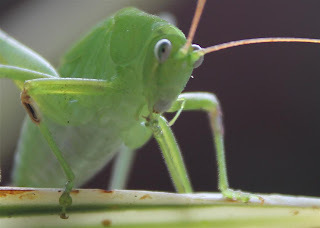 Katydids are not as profuse as grass hoppers. It is a rare visitor, at least to my yarden. They are also known as 'long horned grass hoppers' and 'bush crickets' and it appears that there are numerous species. I am yet to get this one accurately identified as of now. 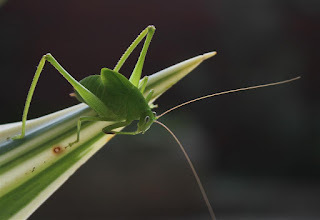 I came to know that this is a Katydid, from Dave's Garden's Insect identification forum. A katydid is actually a friendly fellow. He can hop on to your finger and look at you in the eyes! This post is full of pictures! Entertain yourself. 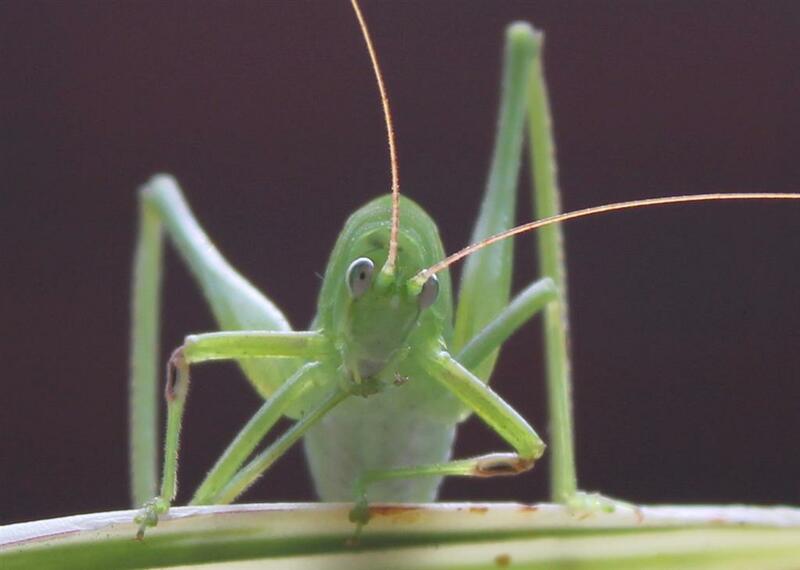 The lovely insect entertained me this morning with its various poses! This is not a fully mature insect. Its wings are still growing. Its green colour is amazing. This was the colour of the scented eraser we used in school in the 60s and 70s. It reminded me of those days! It was hesitant at first, but crawled up. Good early morning sunshine. I let it climb on to an Agave leaf. 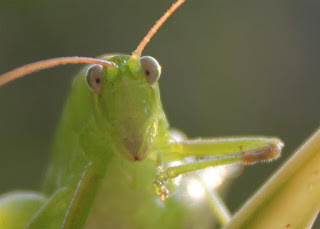 Looks like polishing his mantises with his 'right hand'! I just played with Picasa and increased the 'shadow'. Like we people do sometimes - keep our palm against our chin and think! See the hairs on the elbow! Eyes looking directly! Shall I jump? 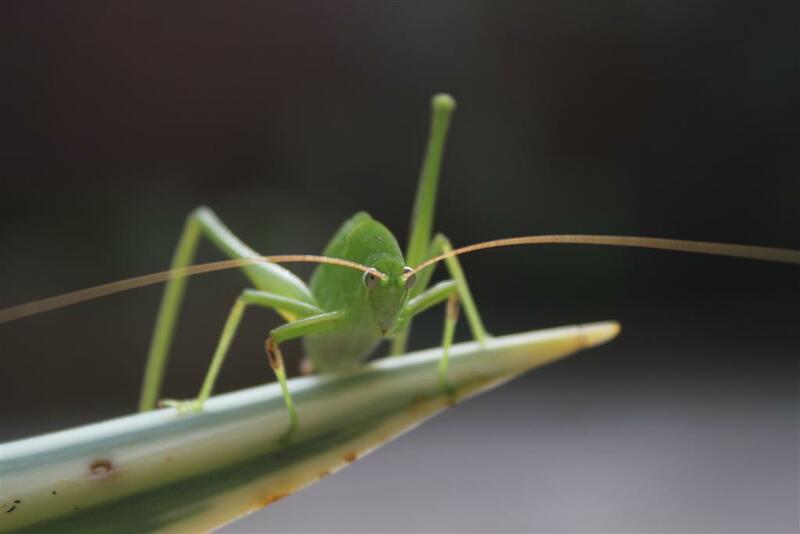 Why did you leave me on this Agave leaf? It has no flowers. Before I jump, see the veining on my strong leg. Thanks to the morning sun for lighting it. Wait, let me think a bit. Still thinking in another pose. Now, it is time to jump. But I am not afraid. 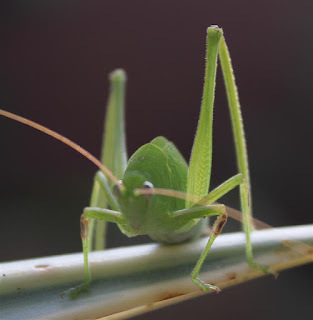 In a few moments, there he was among the grass blades, camouflaged. Bye and have a nice day! Common grasshoppers in the yarden wont come near. They hop away. 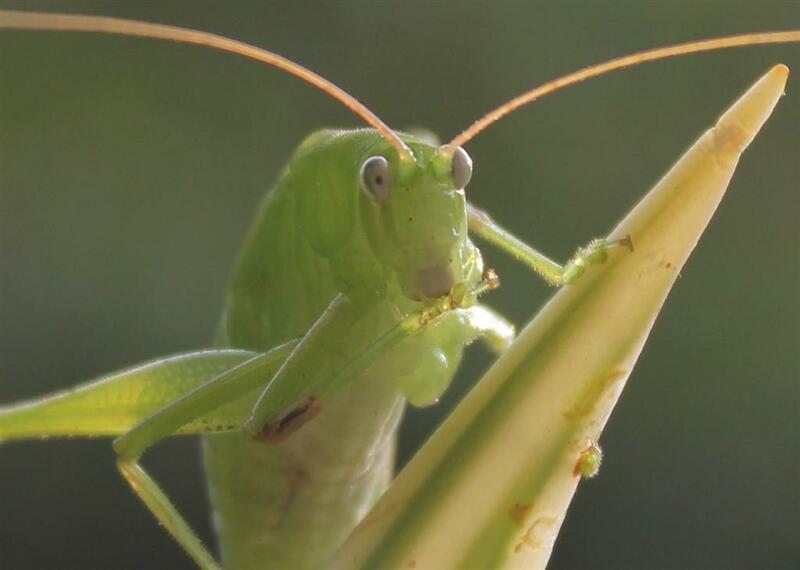 But Praying Mantises do play with us, like the katydid. A couple of pictures. 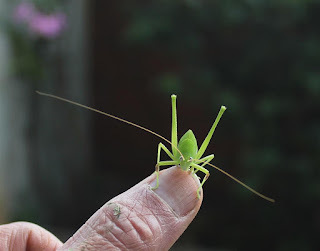 This is an adult Katydid - picture taken in 2009, in the yarden. They are seen occasionally. 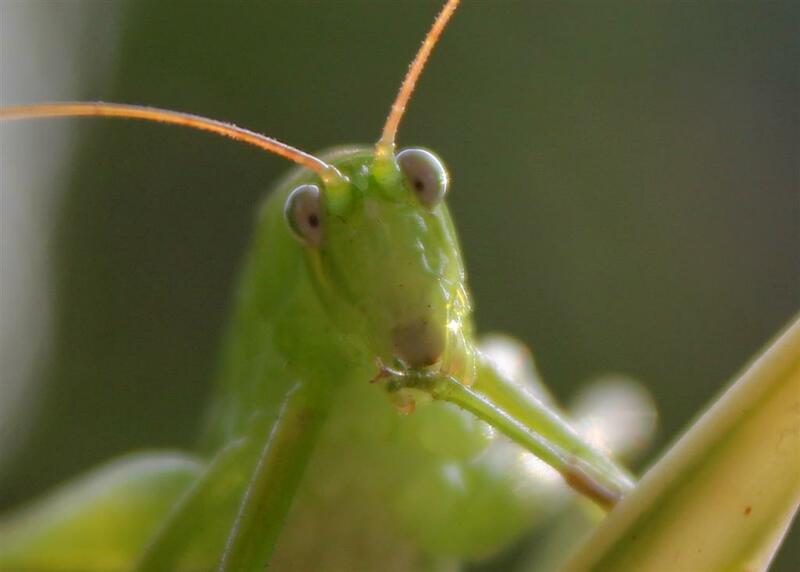 This is a Praying Mantis. Another old picture. This is an Indian Flower Mantis seen in the yarden. It will turn its eyes and head towards you if you move left or right. It seems to watch the face. In, if I counted right, the sixth shot down, he looks like he's looking at his watch! !